Adobe Systems (ADBE) reports their fiscal Q3 results tonight after the close. The options market is implying ~$11.50 or ~4% move in either direction tomorrow. On average over the last four quarters, the stock has moved only about 2.75% the day following results, yet the average one-day post-earnings move over the last ten years has been about 5%. Shares of ADBE are trading about 1% from an all-time high made just yesterday, up an eye-popping 41% ytd, sporting a market cap of $130 billion, 14.6x expected f2018 sales of $9 billion, that are expected to grow 22% yoy. 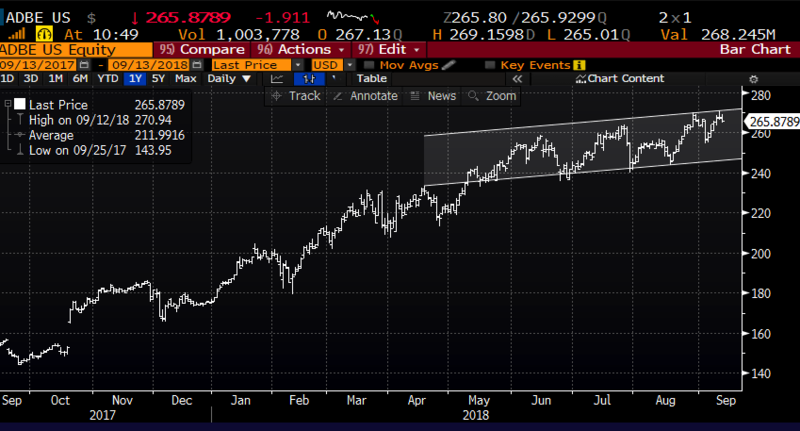 From where I sit, the most important takeaway will be just how much company forwarded guidance will impact investors views on eps and sales growth deceleration in fiscal 2019. Right now consensus estimates are for 56% eps growth (adjusted) and 22% sales growth this year, expected to decelerate to 15% and 19% respectively. Confidence on continued double-digit growth will be key for a stock trading at 35x eps and 13x sales the out year (expected), especially after such a monster run. Since declining 15% in late 2016 peak to trough, the stock has had very shallow pullbacks, and has since rallied 150% since the start of 2017. So what’s the trade? I think there are a couple ways to look at a stock like ADBE that has benefitted massively over the last several years from the secular shift towards cloud-based enterprise software services, and specifically over the last couple years as investors have been willing to pay sky-high multiples for this exposure, even in mega-cap land. Rationale: this is a very binary trade. Get the direction wrong and it will be a total loss, or about 1% for the potential gain of 2.5% if the stock is up in line with the implied move. Or if you thought the company could wiff on the quarter and guide down, given the positive sentiment, the stock’s ytd performance and the high valuation it might make sense to extend the bearish view out a month as a sell-off might be sustained and a good target would be the recent low from early August near $240. Profits of up to 18.50 between 258.50 and 240 with max gain of 18.50 at 240 or lower. Rationale: this trade targets a move back to near-term technical support while risking 2.5% over the next 5 weeks with the potential to make up to 7% if the stock is 240 or lower.